The Fellowes P-35C is a home shredder capable of shredding up to 5 sheets of 70gsm paper at a time. It has a P-4 security rating and shreds into pieces 4x40mm in size, ideal for most personal user requirements. 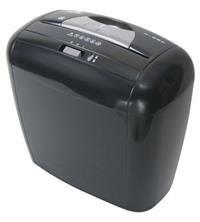 In addition to paper, this shredder will also shred staples, small paperclips and even credit cards. The 12 litre bin is easy to access with a simple lift-off top design, making waste disposal very straightforward. Other features include a reverse function and safety lock, good if you have small children or pets. The shredder will also only operate if the shredder head is sitting in the correct position on the basket, for added safety.